In Detroit they call soda ‘pop’ and chili dogs ‘Coneys.’ In the Valley, we’re hearing the same Motown lingo. The birthplace of Detroit Coney-style hot dogs may be 2000 miles northeast of Arizona, but you can find the same chili, buns, and snappy sausage flavor in a strip mall on Broadway in Tempe. 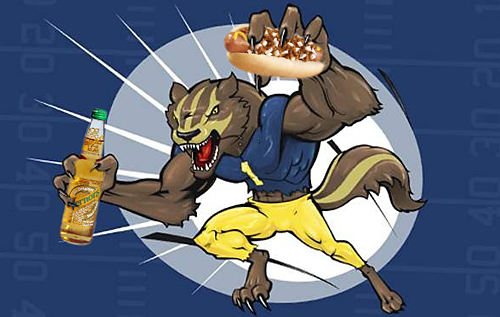 My consort, Richard, a Michigander, and I mean that literally especially when the Wolverines take the gridiron, has been raving about Coney Island dogs for years. Richard has as much allegiance to Coneys as he has to his University of Michigan team who lost three out of five games this season. But let’s talk about a win. David Najor, a Michigan native expat living in Tempe, has recreated the famous Lafayette Coney Island with an arsenal of Detroit-based ingredients (Vernors, Faygo, and Better Made Potato Chips). His meats are as authentic as they can be, made with all-beef natural casing dogs shipped in from Detroit, burgers from scratch, and hand-cut russet potatoes. The two foremost purveyors of Coneys in downtown Detroit, American and Lafayette, have embarked on a family feud for generations. I talked to one Lafayette employee who had nothing good to say about his next door neighbors, American Coneys. But as far as the customers are concerned, they divide into two distinct camps. 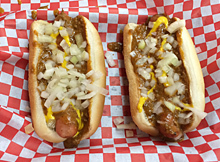 In Tempe, we are lucky—there is only one authentic Detroit Coney. 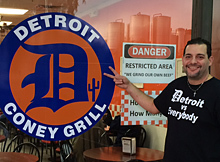 Our tradition is to celebrate a Wolverine win with a visit to the neighborhood Detroit Grill. We haven’t tasted a Coney for two weeks and we’re both craving a dog. Our team plays Rutgers next week. Whoever heard of them? I guess they are new to the Big Ten. See you at Coneys after the big win! Go Blue. Awesome Review, Hope the Wolverines can get it together.